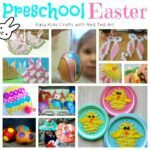 Time for more easy crafts for kids. The fun and spooky season is approaching. We adore Halloween and all Halloween crafts. However, when you have younger kids, you don’t really want to scare them, but you still want to involve them. 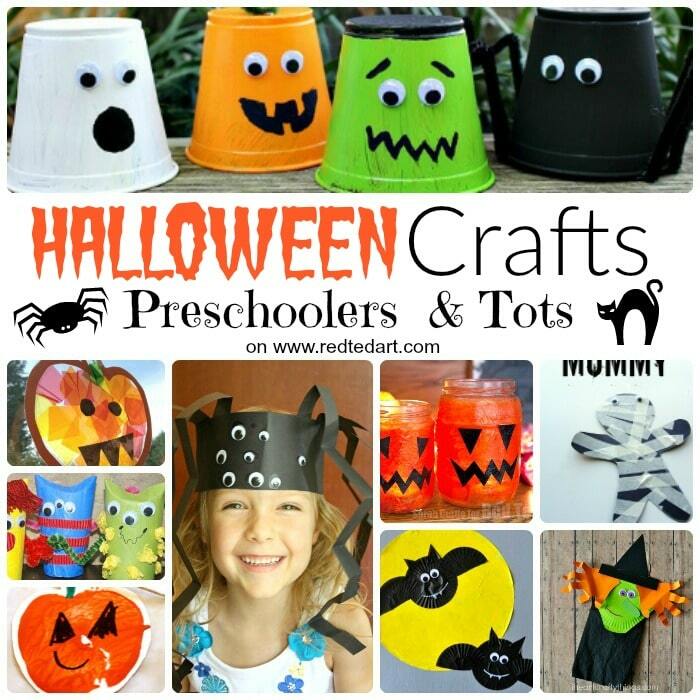 That is why, I thought it would great to put together a Halloween Crafts Toddlers & Preschoolers list – a collection of ideas that are cute and easy to make. 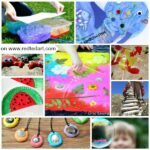 Needless to say, the Toddler and Preschooler age group have some challenges when it comes to fine motor skills.. so I have picked what I think are do-able projects – some may be collaborative and your child will enjoy playing with the end result, others the toddler or preschooler will hopefully be able to achieve by themselves. Remember.. when working collaboratively, try and let your child do as much as possible by themselves. We particularly LOVE the wonky eyes and the crazy colour mixing that results from when a young child has CREATIVE FUN. It is all about the process afterall! I will add some comments next to craft as to how involved I think this may or may not be! And remember – all children are individuals and develop at different stages. Some 3yrs old may find somethinge asy, whilst 5yrs old may find the same craft challenging! Work at your child’s pace and let them have fun. Let’s start off these frightfully cute and Easy Halloween Crafts for Preschool that I have made with my kids when they were young! 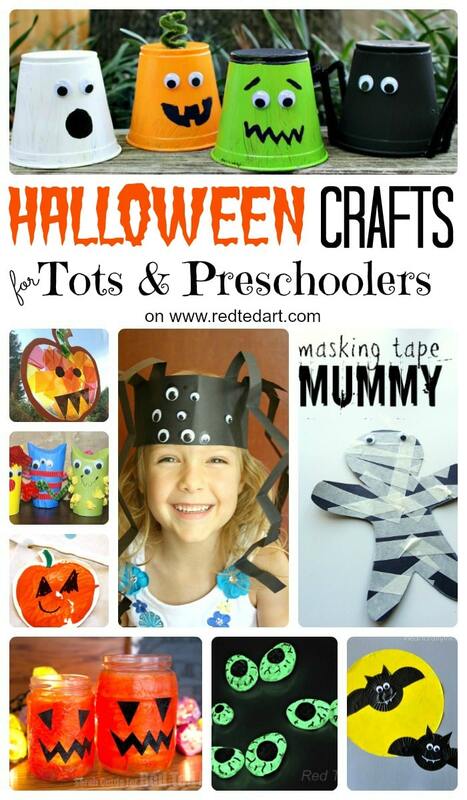 There are some really Cute Halloween Crafts for Toddlers amongs this list. Hope you like them as much as we did! TP Roll Monsters – we love this TP Roll Craft for Kids – as it is so easy, cute and fun. You can use up all your “odds and ends” and there is no right or wrong! Mini Ghost Pinatas (5min) Craft – these are super duper cut and easy. You may need to help with “poking” the hole for hanging or securing the “bottom” of your pinata. Halloween Tin Can Bowling – definitely more collaborative – you may choose to paint, but let your child haev LOTS of fun playing this Tin Can Bowling game. They tin cans can also be used as pen pots and you can add a maths dimension, by letting kids count numbers on the back of the cans or adding them up! 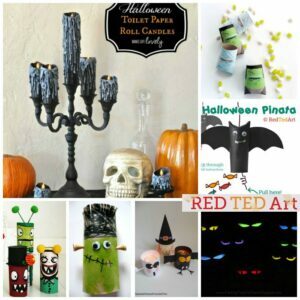 Halloween Lanterns (quick and easy) – we ADORE these lanterns. We made ours about 6-7yrs ago and every Halloween they come back out. Red Ted was only two at the time and loved making these with me. 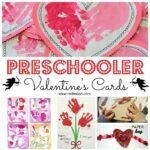 Some direction is needed, but both toddlers and preschoolers will love this one. Pom Pom Bats – we love pom poms. 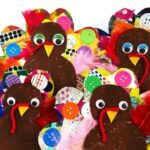 This is a collaborative project – the kids can practice their “wrapping” skills and you can finish the project off. 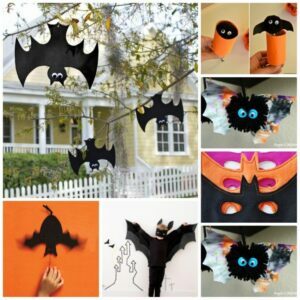 The bats are super cute and make a fabulous young child friendly Halloween craft! Pom Pom Spiders – same as the bats! These spiders also double up fabulously for a but of nursery rhyme action play! Sugar Skull Rocks – This is a great way to let your child enjoy colours and patterns. This is an easy DIY for any age group. You will need to prep the sugar skull scones, but the child will be able to make this into their own unique designs. Sugar Skull Corks – see the rocks! Similary you can turn rocks into glow in the dark eyeballs – these are super fun. The kids can paint and the grown ups can finish off..
Conker Spiders – we love crafting with conkers (buckeyes), you will need to make the holes, but the child can assemble. They double up nicely as Incy Wincy Spider nursery rhyme accessories. If your kids like to make lanterns.. here are some simple ideas. 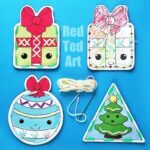 Paper Plate lanterns – these lanterns are super fun, but will require some involvement from grown ups. 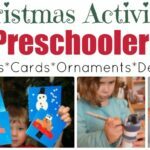 Kids can paint and decorate. Halloween Lanterns (quick and easy) – mentioned above already.. but making sure you don’t miss them!! We adore these easy jack o’lanterns. A great upcycled project too! 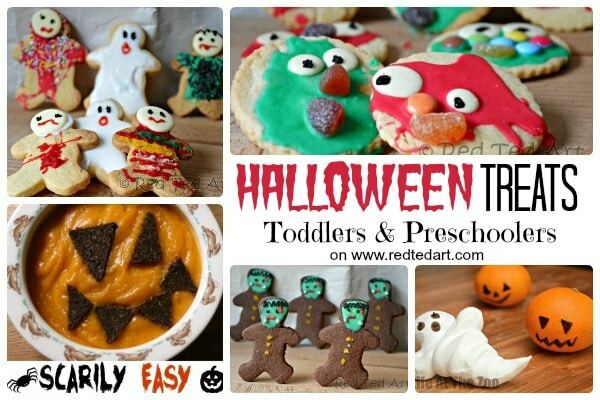 Cute Halloween Ideas for toddlers are not restricted to crafts. Toddlers and preschoolers LOVE to help in the kitchen too. Why not get baking and cooking with them and make some of the easy and fun treats? Healthy Spooky Meal – a tasty and healthy treat to start us off! 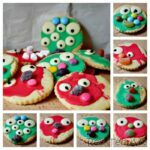 Easy Zombie Cookies – as per monsters, I love these Zombie cookies, as literally “anything goes. Easy Monster Cookies – the more googly eyes the better. Fun with Monster cookies. I don’t know about you but my kids were VERY inconsistent about wearing fancy dress!! Sometimes they were all over it, other times, they insisted on taking it off as we walked out the door and on other occassions, they wouldn’t even put it on. I learnt. Don’t spent TOO much time creating costumes for them and make the costumes as “normal” (ie based on every day clothing”) as possible. That means they can whip of a mask or a tutu and still feel that they are “dress normally”. It also means they can “dress normally” and add the mask/ cape/ tutu later, when they are feeling more confident… some of the things mine have worn in the past! Upcycle and old suit and make a Batman Costume for them! ,,,,Frankestein Masks are a great way to help them join in.. but still allow them to wear “normal clothes! Or why not give this paper spider hat a go? ADORABLE! 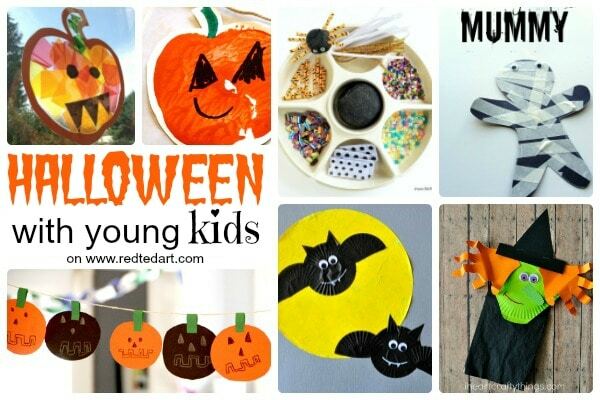 So we have shared OUR hallowen crafts for preschoolers from over the years so far… now it is time for some lovely ideas from sites we love! Masking Tape Mummies – oh my, how cute and oh so easy! The kids will love them. Super cute clothespin bats – great for fine motor skills, adorable results. Puffy Paint Pumpkins – puffy paint is like MAGIC and the kids will love this oh so easy and totally toddler friendly Halloween idea. Easy Halloween Placemats – not only can the kids make them themselves, but they are practical too and make for a great party decoration! Adorable (and colourful!) Halloween Monster Cups! We have made versions of these adorable “stained” glass pumpkins before too. Just so sweet and easy to make. Fabulous Paper Bag/ plate witch! 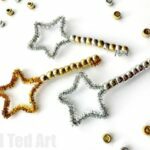 Easy Halloween Garland – a little prep required and the kids can decorate to their hearts content. Love how simple and yet cute this is! Seriously adorable finger print spiders – makes for a great keepsake too! 5 Little Bats Playset – how fun are these? A craft and toy in one! Playdough Spiders – easy to set up “playdough station” – perfect for Halloween playdates! Stamped Halloween Bunting – apples make GREAT pumpkin stamps. Get stamping and drawing. A grown up can then assemble to make this fun collaborative project. Great for all the family or a classroom to get involved. Tissue Paper Box Monster Feet – almost a classic now – that is super fun for kids. Make it. Play with it. I bet you can think of some great party games to go with these Monster Feet! 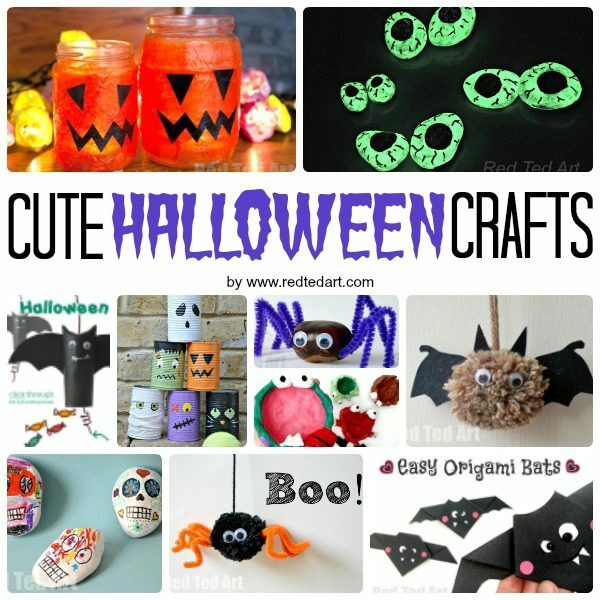 Hope this extensive list of cute and Easy Halloween Crafts for Preschool are enough to get you started and ready for the upcoming spooky but CUTE Halloween season! 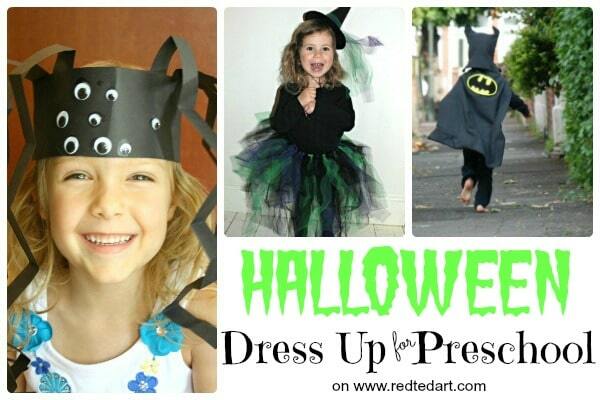 Do let me know what YOUR favourite cute Halloween Crafts for Toddlers is, I would love to hear all about it! As well as our Halloween TP Roll Ideas? Saving the list! Thank you! The kids will be so happy!